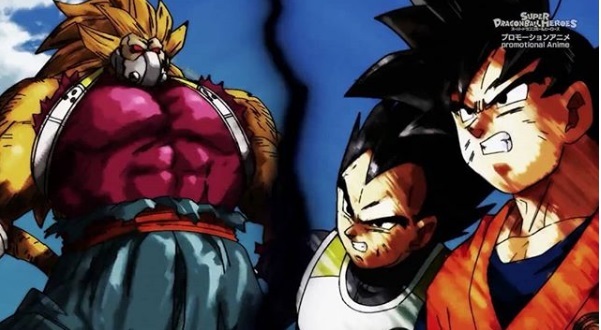 Super Dragon Ball Heroes' Anime Has found a powerful new Saiyan to the permit in Cumber, & he is been even manner showing off how strong he is with the each episodes of promotional Anime Series, with the latest episode of promotional anime went to the extra mile and proved that how strong is Cumber he easily fight with Super Saiyan Blue Kaio -Ken Vegito doesn't even break a apart. Cumber strange Evil Ki already been a problem for Goku Vegeta & Trunks where their last attack was meaningless. Cumber didn't even take a simple damage or not even notifiable roughen but his powers increases the more he fight like with Saiyans Brothers. In the lastest episode, he able to fight up with fuse of Goku and Vegeta in his base form where Vegito even can't handle him in Super Saiyan Blue Mode.So he tries to change into Super Saiyan Blue Kaio-Ken Vegito to state it compensate but Cumber was able to counter Vegito's Kamehameha wave with large Ki blast. As Vegito Continue to fight with Cumber laughs and commit to crush Vegito with his own hands.By mean he change into Golden Oozaru by using artificial full moon devices when he cahnge into that big ugly Monkey he gain more power to blasts away Vegito hard enough to separate Goku & Vegeta from one another. The Intense Battle with Cumber seems to be starting point where Cumber seemingly endless well of dark power to draw for making him one of the most Strongest Villans in franchise Yet.